This interesting surname, is of early medieval English origin, although later strongly associated with both Wales and Ireland. 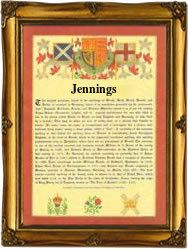 Recorded in the spellings of Jennings, Jennins and Jennens, it is a patronymic. It derives from the given name Janyn or Jenyn, a diminutive of the personal name John, and meaning "Little John". John itself derives from the Hebrew name "Yochanan", meaning "Jehovah has favoured (me with a son)". The patronymic surname which in this case means "the son of Little John", dates back to the late 13th Century (see below), "John" being a 12th century Crusader introduction. Soldiers of the crusades returning from the Holy Land, gave to their children and specifically sons, Hebrew and Greek names as a reminder of the fathers "pilgrimage". These "English" personal names which later became surnames, include such examples as Thomas, Isaac, Abraham, and many others. In this case early recordings include Walter Jannes and Richard Janyns in the Subsidy Rolls of Worcestershire of 1327, and Thomas Jenyn, in the charter rolls of 1428 known as "Inquisitions and Assessments relating to Feudal Aids". Elizabeth, the daughter of Thomas Jennyns, was christened on August 9th 1544, at St. Pancras', Soper Lane, London, and Jeffrey Jennings was christened on August 24th 1561, at St. Dunstans in the East, London. Among the namebearers in the "Dictionary of National Biography" is Sir Patrick Alfred Jennings (1831 - 1896), who was Premier of New South Wales. He was born in Newry, Ireland, and emigrated to the gold fields of Victoria in 1852, before moving to New South Wales in 1863. The first recorded spelling of the family name is shown to be that of Roger Jonyng, which was dated 1296, in the Subsidy Rolls of the county of Sussex, during the reign of King Edward 1, known as "The Hammer of the Scots", 1272 - 1307. Surnames became necessary when governments introduced personal taxation. In England this was known as Poll Tax. Throughout the centuries, surnames in every country have continued to "develop" often leading to astonishing variants of the original spelling.